Late for work? Imagine skipping the subway and instead heading to your local “vertiport,” where you can hop into an aircraft the size of an SUV that runs on electricity and works pretty much like an elevator. Get in, punch in your destination, and off you go. Alone. It may sound like an episode of “The Jetsons,” but electric air taxis are a form of transportation that is coming to Dubai in just a few months. And investors hope American cities aren’t much far behind. Exotic prototypes are being designed, built and flight-tested by companies ranging from Airbus to startups bankrolled by tech billionaires such as Google co-founder Larry Page. The business case is being made most eagerly by Uber. The San Francisco-based rent-a-ride provider wants to live up to its name — German for “over” — by making it possible for customers to use their Uber cellphone app to order up a lift by car or air taxi or a combination of the two, whatever is most convenient and economical. Uber sees e-VTOLs as the answer. “Flight is a natural extension of what we’re doing,” said Jeff Holden, Uber’s chief product officer, who created Uber’s self-driving-car laboratory in Pittsburgh. Uber will host an invitation-only “Elevate Summit” in Dallas from April 25-27. There, Holden and others from Uber, along with leaders of companies developing and investing in e-VTOLs and related technologies, will discuss the many issues raised by the concept of urban air transport. It’s a 21st century take on a notion that’s been around since the advent of powered flight. “A vehicle that can take you from your home to your office, to your country club, to your bank or to your friend’s house, by air or by road, whichever is most convenient, will have a vast usefulness,” test pilot James G. Ray told a Philadelphia conference on VTOL aircraft — in 1938. Configurations vary, but many e-VTOLs look and work something like quadcopters and other hobby drones — one source of inspiration for the concept. Advances in batteries, electric propulsion, artificial intelligence, and sensors, coupled with lightweight composite materials, now make it possible to think about sizing little drones up to carry people. To keep competitors in the dark, some e-VTOL developers — like Google co-founder Page’s startup Zee.Aero — refuse to talk about their designs. But most use some combination of battery-driven electric motors to run propellers, rotors or fans held in arrays around the passenger cabin or in rows on top of, or embedded inside, wings. Some have tilting wings and a tilting “canard,” a stubby wing out front to add stability. The idea of helicopter taxi services was once popular among urban planners and architects such as Le Corbusier and Frank Lloyd Wright, said Roger Connor, curator for rotorcraft and drones at the Smithsonian National Air and Space Museum. Various companies began offering helicopter air taxi services in New York and other big cities after World War II, Connor said, but they proved unprofitable. “Demand was high, but profitability was elusive, because even the most efficient twin turbine helicopters could not keep the seat-mile costs to an economically viable level,” Connor said. Advocates say e-VTOLs will work for urban transport where helicopters haven’t because, being electric, they will be cleaner, quieter and cheaper. Some experts take strong issue with the latter point. Just because electric motors aren’t loud doesn’t mean e-VTOLs will be quiet, said John Hansman, a Massachusetts Institute of Technology aeronautics and astronautics professor. Electric VTOLs, after all, still have to spin rotors, propellers or fans at speeds that create substantial noise. “Even on a jet engine, most of the noise is not the engine, it’s either from the fan or the exhaust jet,” Hansman said. Take the buzz of a toy drone and scale it up to a 4,000-lb. vehicle and “it’s probably not going to be silent,” he said. Uber wants to be a catalyst for e-VTOLs, dangling the carrot of its 40 million monthly worldwide users and nearly $70 billion valuation to spur technological, regulatory and cultural progress. For the scheme to work, the Federal Aviation Administration will have to figure out how to certify e-VTOLs as safe and adopt air-traffic rules to govern them. Cities will have to build or be equipped with vertiports and other infrastructure. Citizens will have to accept the idea of e-VTOLs crisscrossing city skies. They’ll have to accept the cost, too. Uber calculates that a 50-mile air taxi trip “might initially cost around $129 and eventually be as cheap as $20,” said Uber’s Goel, as ridesharing and higher demand for such rides make it easier to pay for e-VTOLs. Elsewhere in the world, the authorities are less picky. 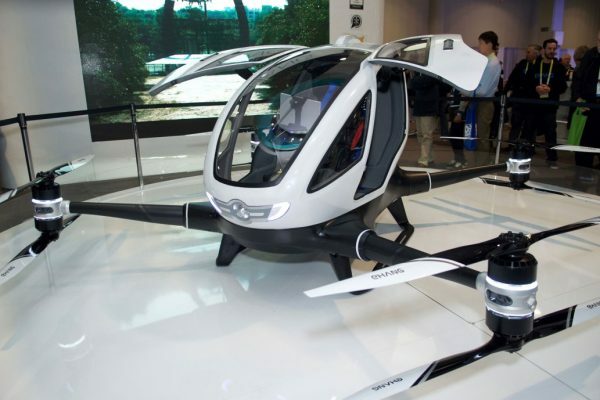 The Dubai Roads and Transport Agency announced in February that Chinese drone technology and services company EHang will be allowed to fly air-taxi trips in that United Arab Emirates metropolis starting this July using its EHang 184 Autonomous Aerial Vehicle. The EHang 184 is a one-passenger “quad multicopter” with a total of eight propellers stacked in vertical upper and lower pairs that turn in opposite directions at the end of four arms. The propellers are run by electric motors powered by lithium polymer batteries. EHang says the 184 can fly one passenger weighing less than 220 lbs. on a trip lasting about 23 minutes. Neither Dubai nor EHang offered details, but news coverage posted to EHang’s website said that while the 184 is designed to be autonomous, initial flights in Dubai will be remote-controlled from a command center able to land the aircraft immediately in case of problems. “I’m not getting in one,” said Eric Raymond, who has designed and flown solar-electric and battery-powered electric airplanes since 1989. Raymond — a former hang-glider aerobatics world champion — thinks none of the e-VTOL designs he’s seen are practical or safe. Batteries are heavy and as a rule can store only a fraction as much energy as aviation fuel, so e-VTOLs are going to have extremely limited flight endurance, Raymond noted. And if they lose power in flight, he said, e-VTOLs without good-sized wings to glide down on or rotors big enough to “auto-rotate” like a maple seed are likely to drop like a rock. Reading Uber’s white paper offered Raymond no comfort on that point.